Carrie Bickmore pregnant with third child: Why she has the right idea. 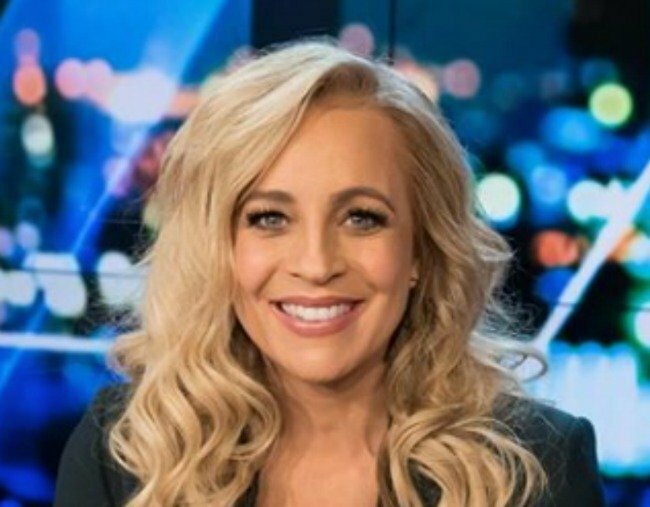 Why Carrie Bickmore has the right idea about her third baby's room. Everyone lives on a spectrum (budget? time?) when it comes to the desire to have a dedicated, decorated, baby room. On one end, there are those who call in an interior designer and mull over colour mood boards whilst picking out the appropriate white shearling rug to have under the bespoke cloud rocking horse. When mags cover a celebrity ‘nursery reveal’ that’s certainly what we are led to believe. On the middle of the spectrum, are those like myself, who enjoy putting together a little space, with a few beautiful things that reflects their own style and taste that they will likely teach their baby. That is until the baby learns to talk and demands luridly coloured licensed bed sheets and a frozen foam sofa. This baby room journey, however, is often only reserved for baby numero uno. Cue baby number tres. We are rapidly outgrowing our semi and even having a baby room has come into question “Where are we going to put the baby”?, “Who will he share with?” “Should we renovate again? No! We are NOT renovating again”. &apos;When juggling more than one child the baby room journey becomes nothing but a myth.&apos; Image: Supplied. None of these questions fazed me during my pregnancy. In my mind he would sleep peacefully in our room and then when he started sleeping through the night, say at around nine months (that’s giving him good grace, right?) I would transfer him to my daughter’s room. She was the closest in age and the least likely to inflict bodily harm. He was our third baby, he would be chilled, he would sleep anywhere, that’s what third babies do, right? Well, this little fella, is chilled EXCEPT at sleepy time. He’s such a laid back smiley champ but as soon as you enter the bedroom you see his face drop, the corners of his mouth start to twitch and he begins to scour. We’ve devised a charade which includes odd animal sounds, dancing, waving hands and a twinkle twinkle little star YouTube clip, that instantly has him a little more relaxed. However, the energy for such things, at 3am is somewhat starting to wain. Herein lies the major issue with room sharing with baby number three, he has a scream on him that could wake the dead. My husband then tells me he’s been thinking about the possibility of our second bathroom becoming the baby room. The bathroom as bedroom idea was an ingenious scheme hatched by our former neighbours. They had two bathrooms so converted one into a bedroom for their baby until he slept through the night. Sadly, we did the measurements of our second bathroom, but the toilet bowl didn’t quite allow the space for the cot to safely slide in. Kylie Jenner shared a sneak peak into her daughter Stormi’s nursery on snapchat earlier this year, and it’s alleged she has opted for only natural and organic furniture for her daughter’s room, so I start to wonder if you can get organic toilets and bathroom sinks? I scour the web for more smart space saving baby room ideas. Things like turning a cupboard into a baby room (just remember to take the doors off, they add) was a common suggestion. Where does one then put their clothes? The bathroom idea is sounding more sensible by the minute. Too exhausted to come up with more inspiring baby room ideas we decided to move out of our bedroom and take refuge on the fold out couch, in the kitchen. Two months passed, the spokes on our couch began to break, one by one, and our backs followed suit. Then one day, the abyss that is my baby brain, vacantly remembered a cot on wheels my mum had in the back of her house. Our baby could become a travelling gypsy and once asleep we could transport him into the lounge room and we could soothe our fossilised backs on our very own bed in our very own room. He could in turn be soothed by the humming of the dishwasher and air-conditioner, win-win! After 3 year’s I am finally decorating my daughter’s bedroom ??? ?‍♀️ will probably finish the baby’s room by the time it’s moving out of home ???? It later dawned on me that my very own baby room (I was also baby number three) was also a shambolic affair. Three coloured lights is my main memory. Not the beautiful subtle muted lights of a heico toadstool lamp or those of a skip and hop owl omitting dulcet womb like tones. No, it was the three brightly coloured lights of a large freezer that shone through the darkness, as its fan whirred along. I recently saw Carrie Bickmore posted a photo of her three-year-old daughter’s bedroom on Instagram, saying she had finally got around to decorating it. My daughter’s room (also the second child) was equally only just decorated at three years old. Carrie then went on to say (she is currently pregnant with baby number three) “will probably finish the baby’s room by the times it’s moving out of home”. I’m totally with you Carrie and judging by the comments from other mums under the post, maybe this baby room malarkey is just another pressure we need to relieve ourselves from. In the meantime, never underestimate the power of a cot on wheels. For more from Miriam Gascoigne, you can visit her website, www.podtales.com.au or follow @podtales on Instagram.